A ‘flattie’, for those not in the know, is delightful South African slang for a spatchcock-chicken. Now when it comes to cooking chicken that’s been split open and flattened, there really is only one way to do it justice I think, and that’s on the braai or barbeque as my American mates call it. 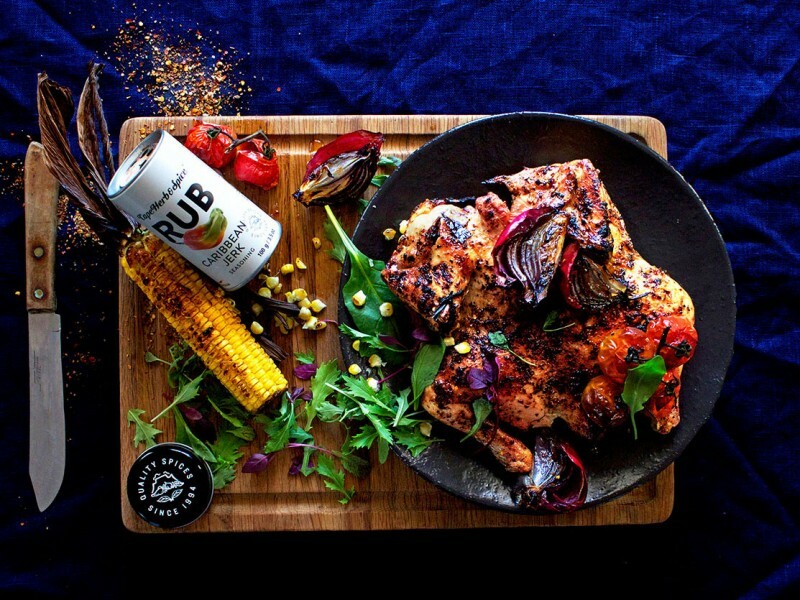 Because it’s flat, it’s more suited to cooking on a traditional open braai than a chicken left whole would be. Being a lazy ‘braaier’, I much prefer doing mine on a kettle braai. Whichever way you roll, up the culinary ante with Cape Herb and Spice’s Caribbean Jerk Seasoning. It has a wonderful touch of chilli heat, fragrant thyme and aromatic all spice and cinnamon. I combine it with olive oil, honey and lime to make a sweet ’n sour jerk baste that’s seriously moreish. Serve with braaied red onions, mealies and braai-blistered vine tomatoes for the ultimate all-done-on-the-braai summer lunch.